Some fear it. Some love it. 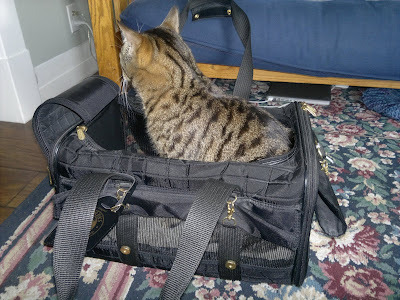 The bag is out because Buddy came home from having his teeth cleaned. The cleaning part went well, he had a cavity so they extracted the tooth. No fillings for my cats! When it's Theo's turn for dental work, I will inquire about getting him a gold crown, it would fit his image quite well! Anyway, the vet did a full blood panel and learned Buddy was anemic again. Apparently his bone marrow is creating the red blood cells but something is causing them problems. The vet sent off a bunch of samples to the lab for further testing. Should know more tomorrow. I am very thankful the dental work went fine and Buddy came through just great. Willow and Rose run and hide at the sight or sound of the dreaded cat carrier bag. Theo has the opposite reaction, he comes running and hops in, waiting for his turn to go somewhere. He loves going places and knows the bag means an adventure! Buddy, just sayin', that bag is BAD! Theo, are you nuts? LOL! Buddy, we're glad you're fine and are sending purrs re: your anemia. Every time my babies see their carriers come out, they bolt and find something to hide under -- usually the couch. I'm glad all went well with the dental work. Please keep us all updated about the anemia.